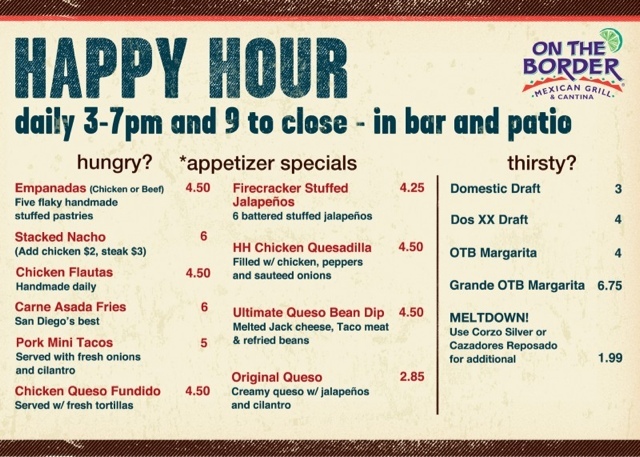 Chili's: Mon-Fri 3-6pm and 9-close, and all day Sunday: $4.99 menu in bar/bar area. On this menu: Pizza, wings, boneless wings, egg rolls, burger, chicken sandwich, chicken caesar salad, etc. •Also, $3.69 and $4.69 for 16 and 22 oz Sam and Sam Summer. •Dinner for two under $20 to $35 depending on drinks! Carrabba's: Monday night 3 course meals for $12, $15, and $18 dollars each. Tons of choices. Also 4 or 5 drinks for $5 each. Olive Garden $2/25 menu with meals, choice of two appetizers or split a dessert. Special thanks to my Frugal & Fab guest poster, Cody - who compiled all these deals for you. Thanks Cody!! !